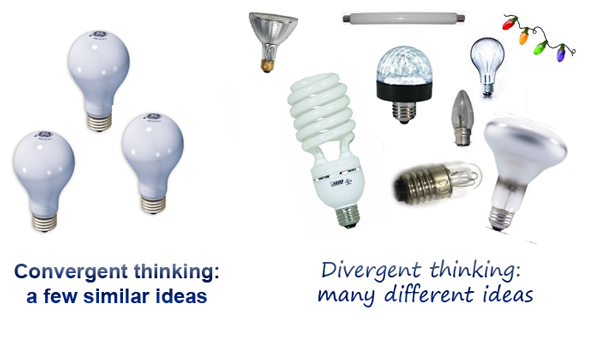 Divergent thinking is the ability to generate many different original ideas in response to a given problem. In a video that’s gone viral recently (at least among educators), Sir Ken Robinson points out that divergent thinking skills are diminished as we proceed through the educational system. Once out of school, we can all let our creative flags unfurl right? Well, workplace environments generally don’t encourage divergent thinking either. In most high-pressured work environments, the natural response is to leap to the simplest, least resource-depleting solution as quickly as possible. “How about trying…. ?” is often greeted with “That’s just not how we do it.” This is natural, but it’s probably not the most competitive position to take. This isn’t to say that convergent thinking doesn’t have its place. 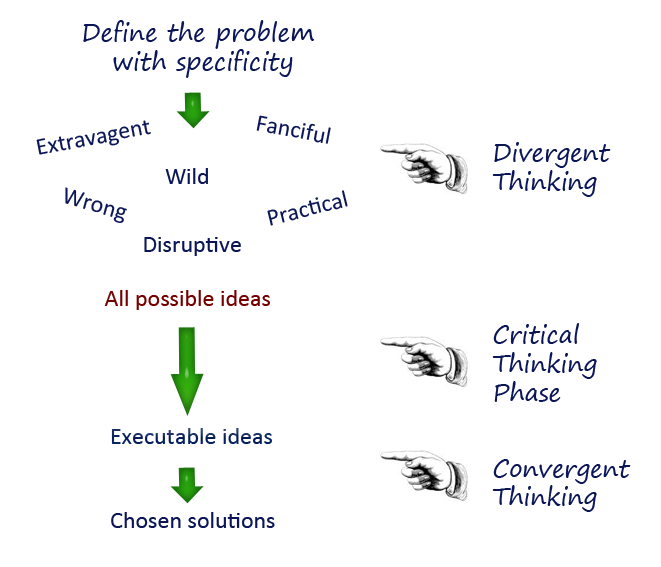 Both convergent and divergent thinking processes are required for creative problem solving and to move from the idea stage to the execution stage. In innovation workshops I’ve been in, success (as measured by the number of quality invention disclosures, for example) is highly dependent on being able to have both types of thinking, but there is a critical timing or flow. Like anything that takes practice and requires supportive feedback, divergent thinking needs to be nurtured in the workplace. Despite the current emphasis on social learning, high performers do not a priori flourish in groups and paradigm-preserving behavior is actually more likely than paradigm-disrupting behavior in most groups. Further, autonomy is an important part of a creative environment. Autonomy motivates and allows workers to take ownership of their work. Supporting autonomy and positive group behaviors at the same time can be challenging. Group dynamics have to be rethought to foster divergent thinking. Brainstorming is one appropriate way to foster divergent thinking, but it’s not the only way. Further, there are processes that can be implemented to support and enhance brainstorming. And, we need to look at group behaviors at bit more. So to end with a cliffhanger, stay tuned for the next post. Schlicksupp, H. (2004). Ideenfindung, Kreativität und Ideenfindung, Frankfurt: Societäts-Verlag.